Non Refundable Deposit: $36.00Non-refundable deposit will be charged immediately upon order placement. 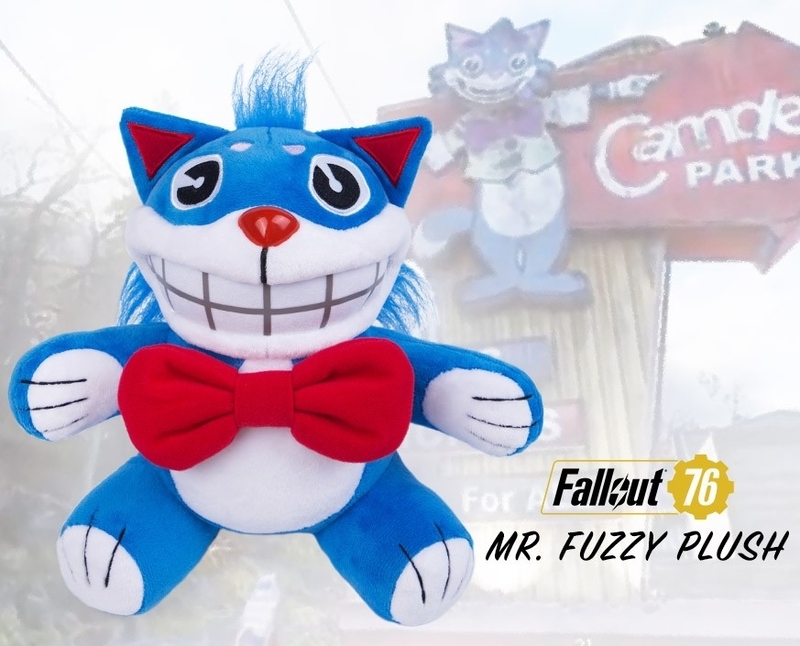 You will earn 360 Credits for purchasing this product. 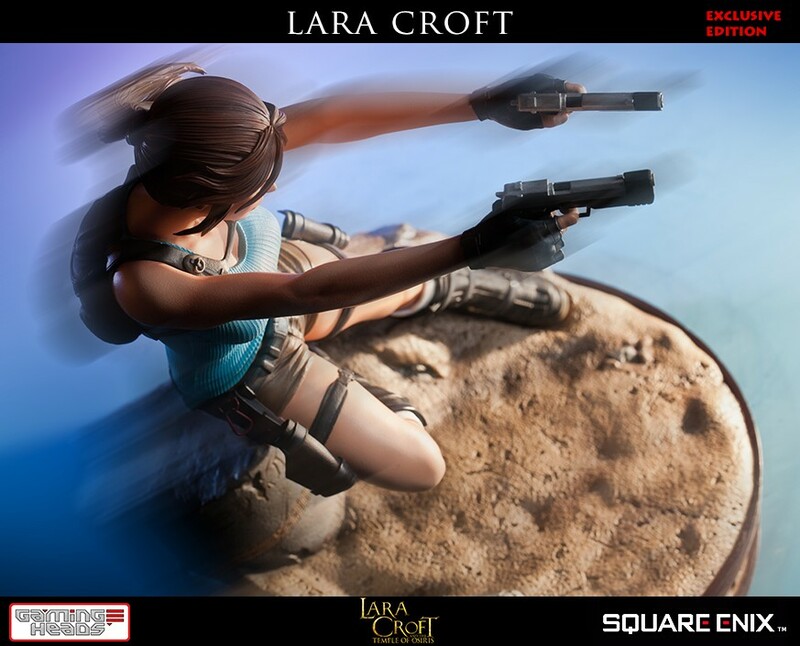 This dynamic and exciting statue of Lara Croft features her caught in action, leaping from a rock firing her dual-pistols straight ahead. 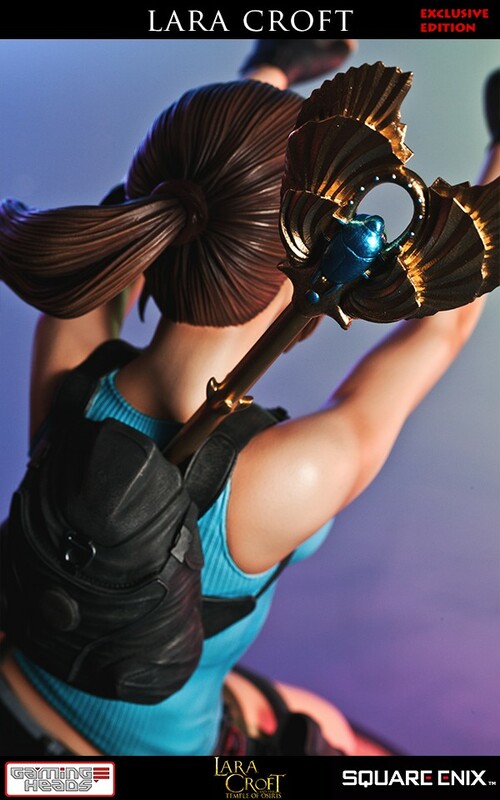 She's wearing her famous turquoise tank-top and cargo shorts, and her hair back in a long ponytail. 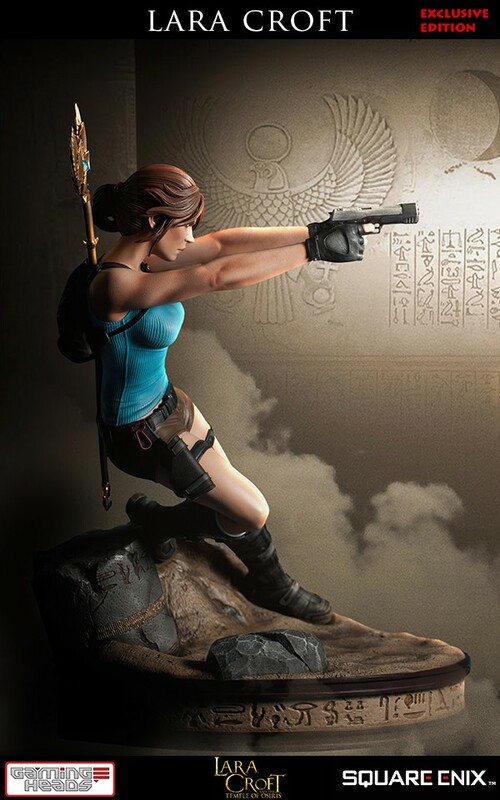 The remains of an Ancient Egyptian relic are emerging from the sand behind her, and hieroglyphics line the rim of the base. 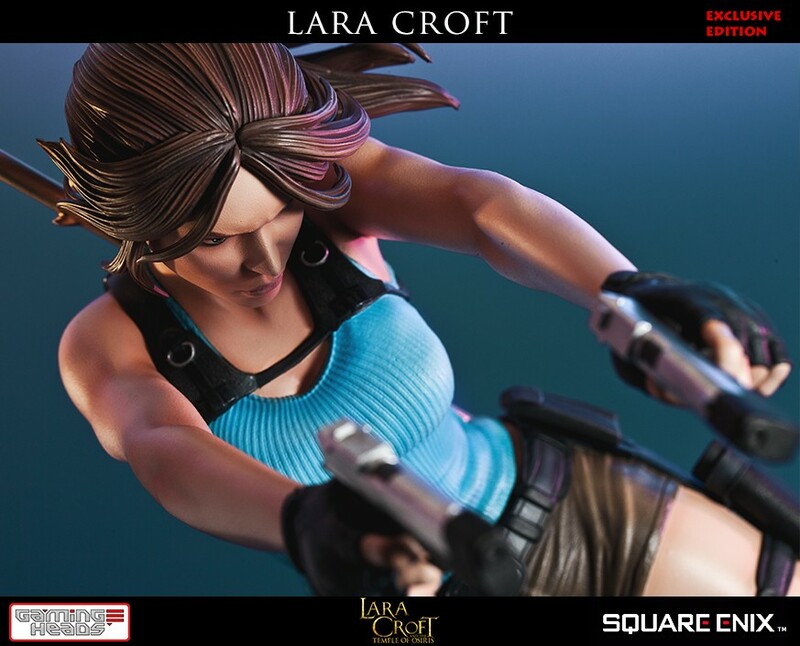 From the base to the top of Lara's head, the statue measures 15 inches tall, and is cast from polystone resin with skillfully hand-crafted details. 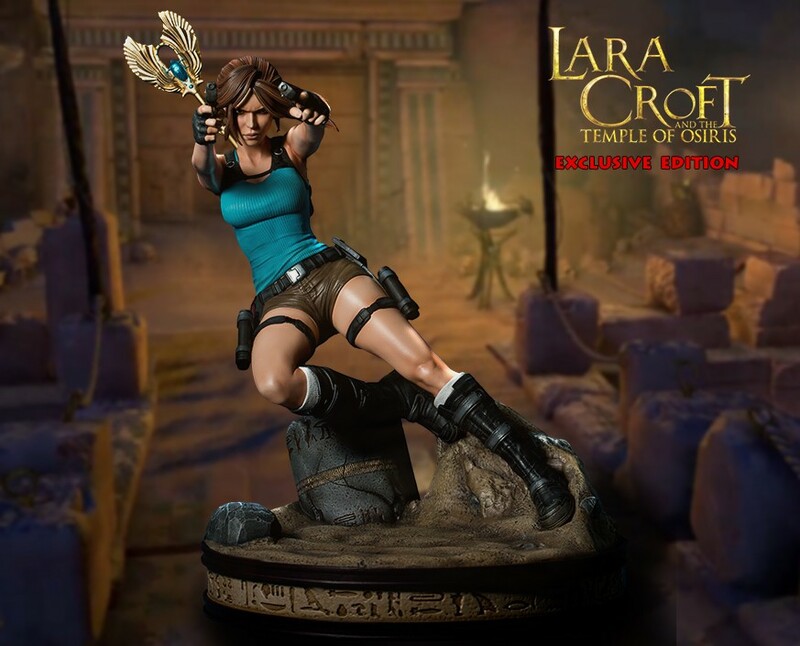 If you have already authenticated the Lara Croft: Survivor statue, you'll be able to reserve the same number Temple of Osiris statue. I'm totally impress with this piece. 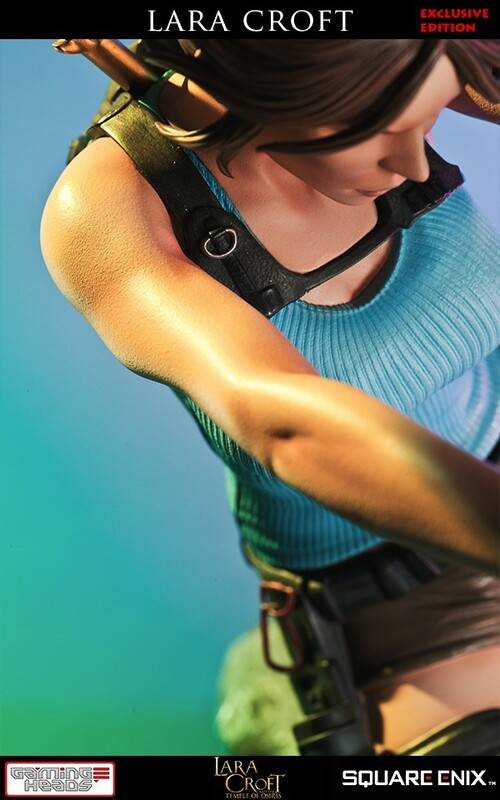 She is what I call the ultimate Lara. 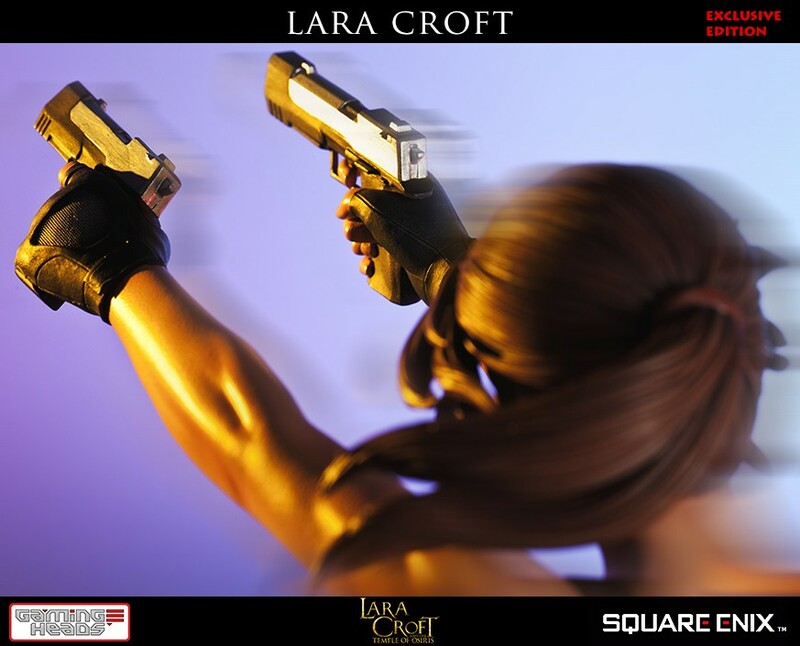 IMHO, Sideshows Lara, doesn't come close to this one, even in the attitude department. 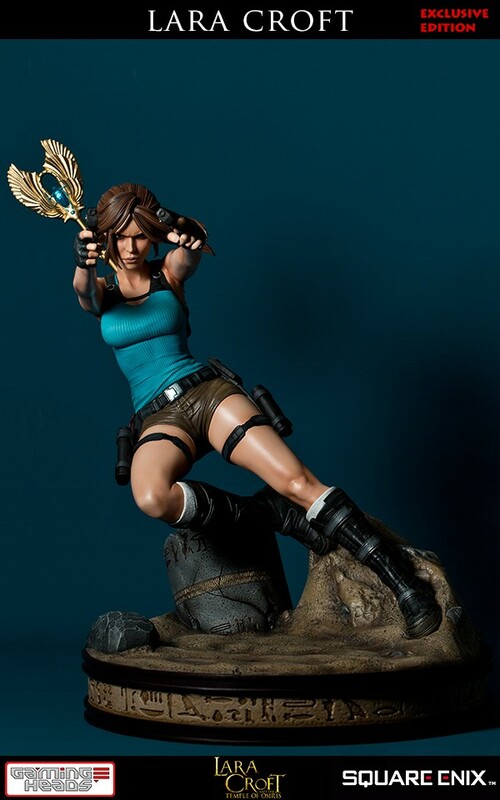 This is a beautiful statue, in attitude and all! I finally got her and she was the last Ex too whew. Glad that I snatched her. 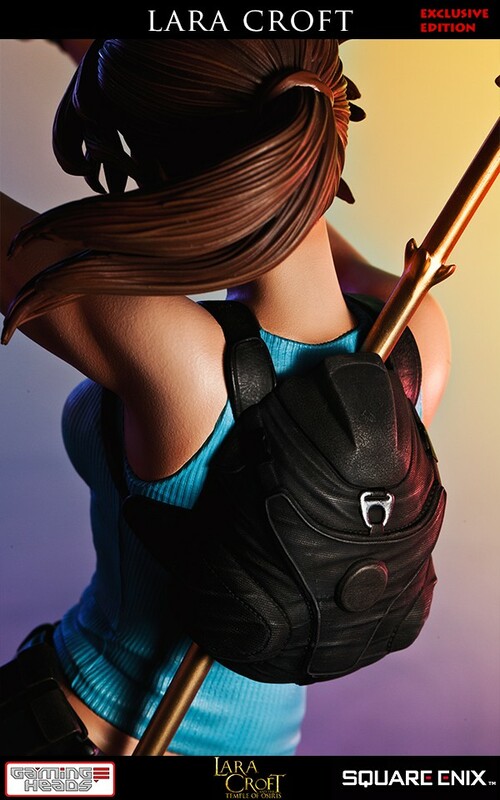 It’s the perfect quintessential Classic Tomb Raider piece, period. I love....love....Love this piece. I did a review over on YouTube so feel free to check it out. 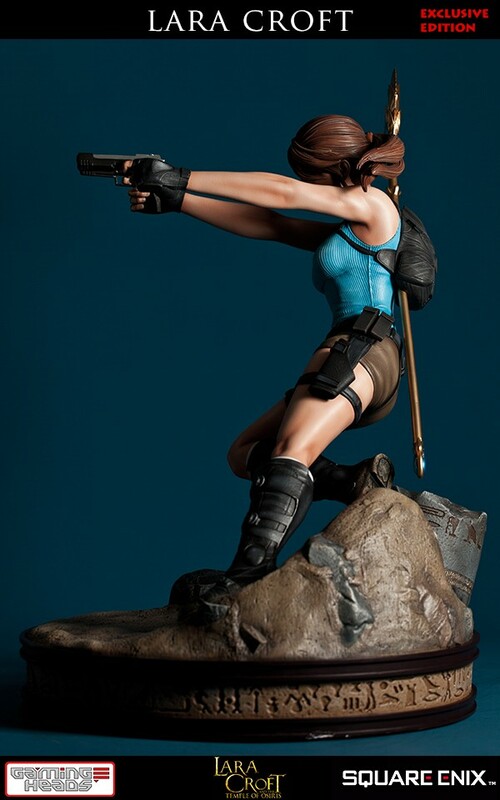 First off I have to say this piece is without a doubt the quintessential Classic Lara Croft Statue. 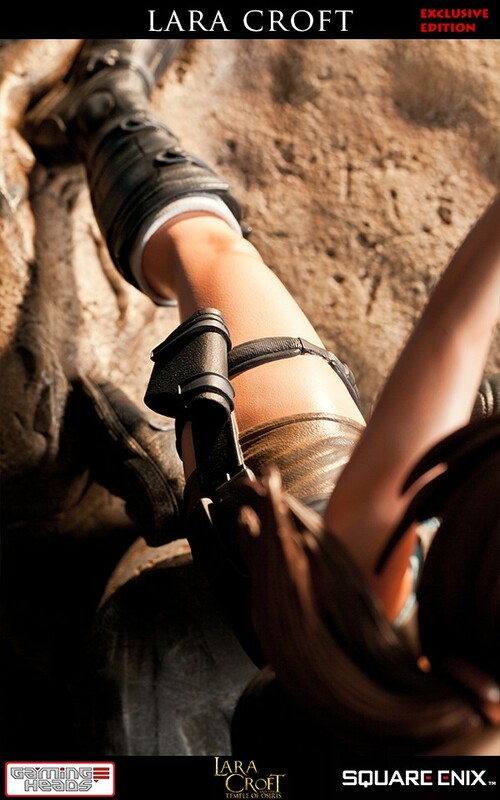 It captures everything you could ever want in a Tomb Raider piece. 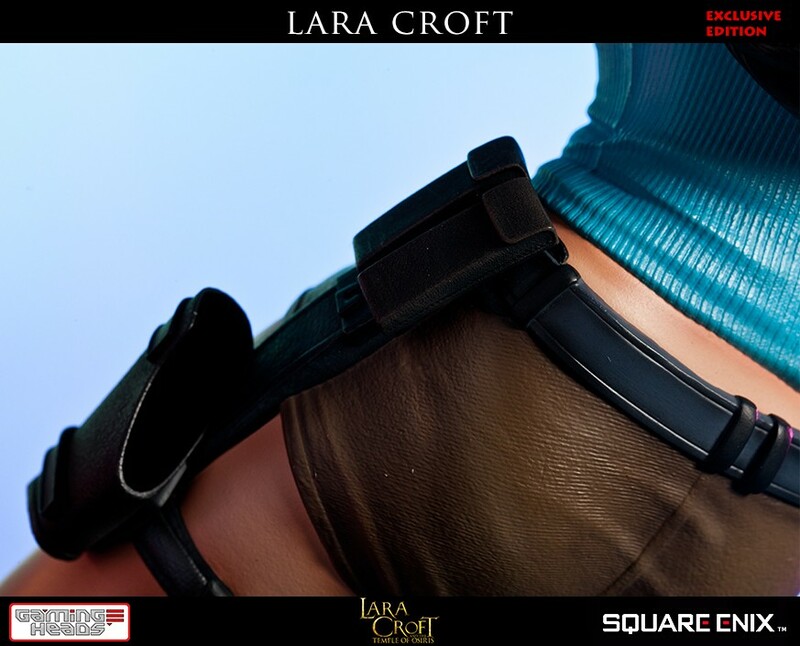 First you have Lara in her classic outfit. 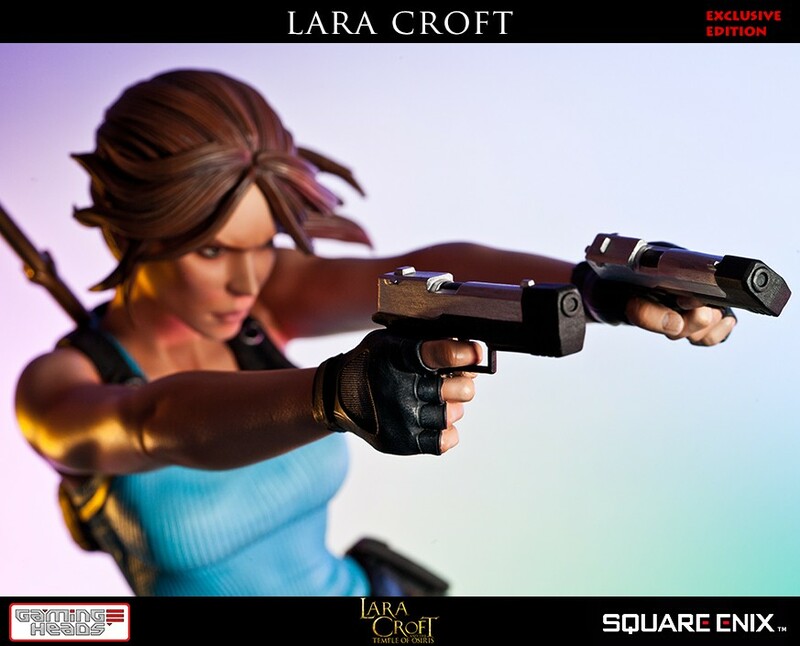 Second she is in a fantastic action pose with both guns drawn. 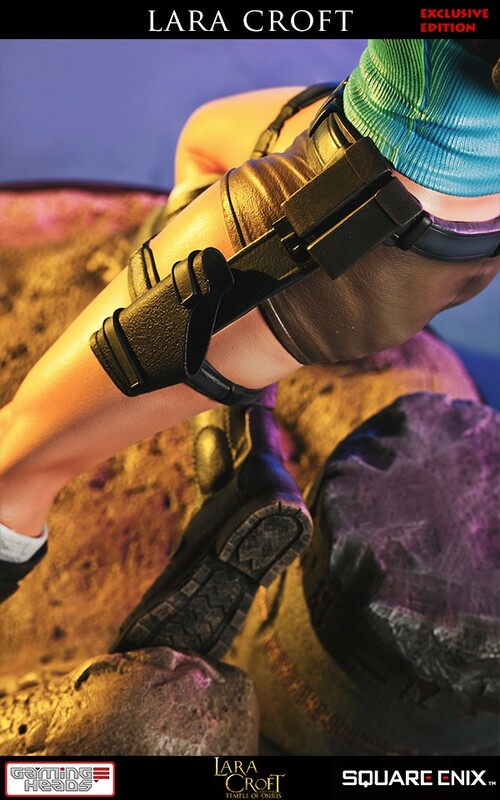 Lastly the attention to detail is immaculate! The sculpt is superb and the paint detail is spot on. 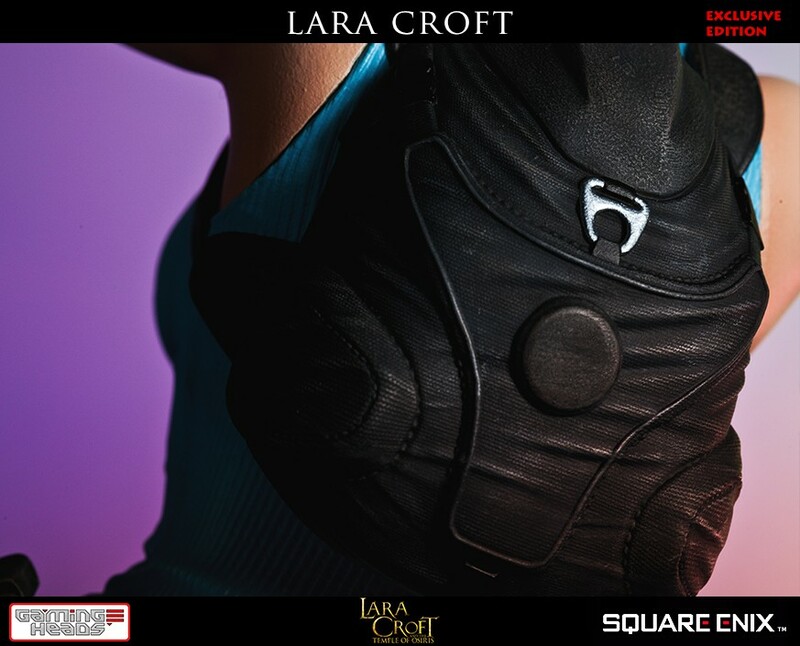 For all those that didn’t think Lara looked pretty enough...they have to be crazy. 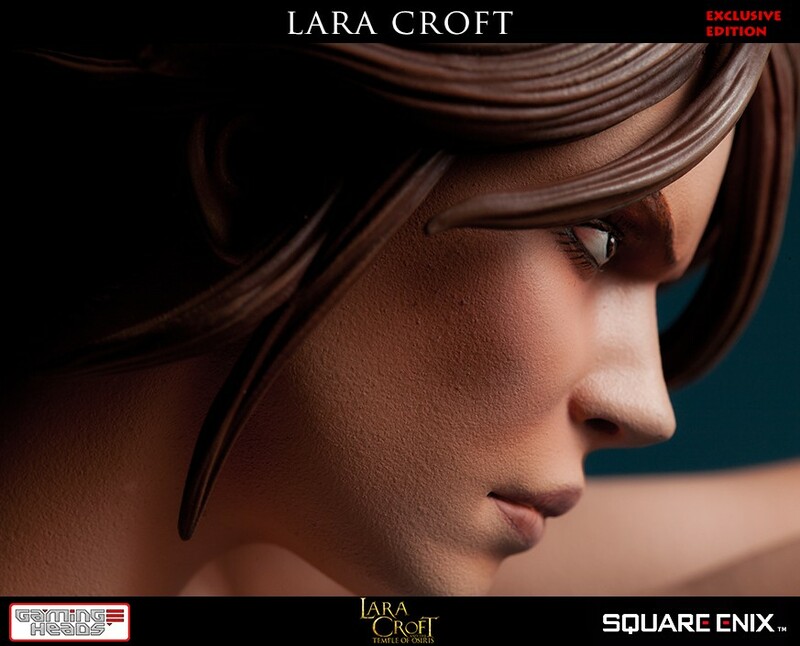 Because the headsculpt is perfect Lara! She’s beautiful, bold, and determined all while showing strength while being drop dead gorgeous....not sure what else one could want. My biggest debate was did I want the exclusive or the regular version....I opted for the exclusive, the staff is a nice touch. Needed? No....and if you get the regular version I doubt seriously you’ll miss it, but makes for a nice extra if you go that route. 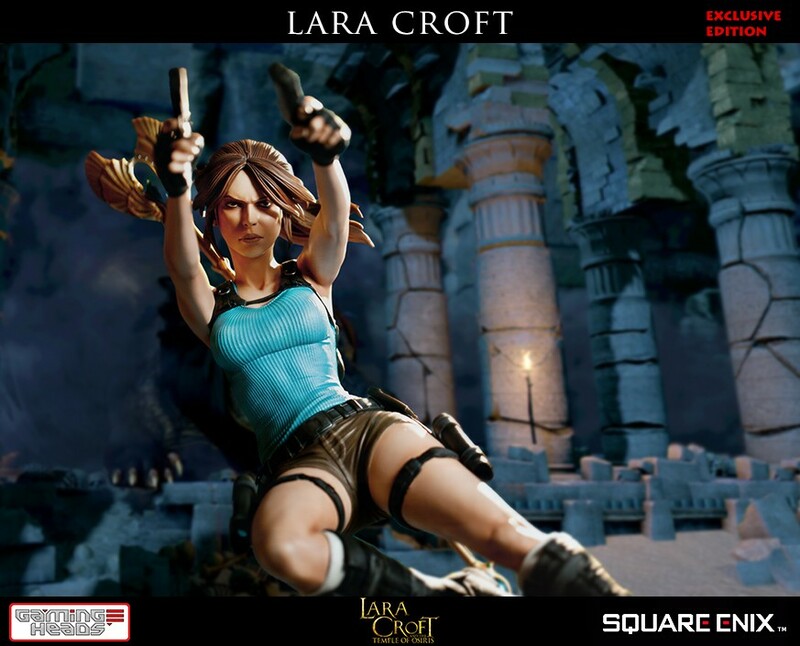 I just received my Lara and I am excited to say that I am impressed by the quality of this statue. 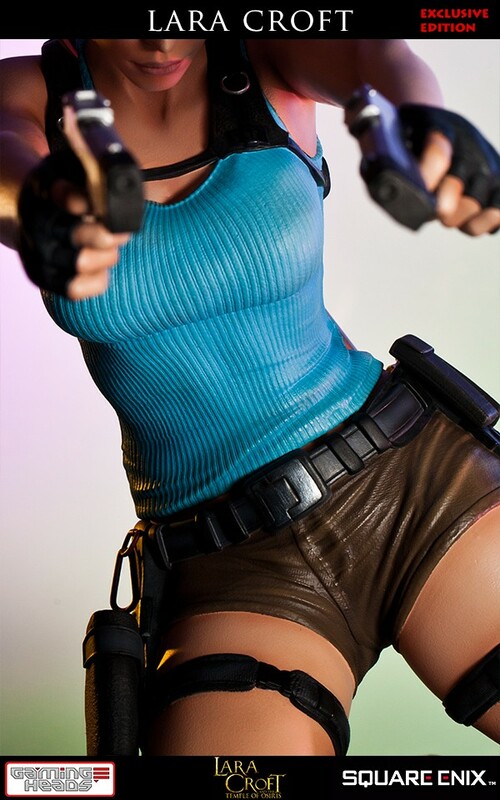 The sculpt is classic and the paint job has zero imperfections. 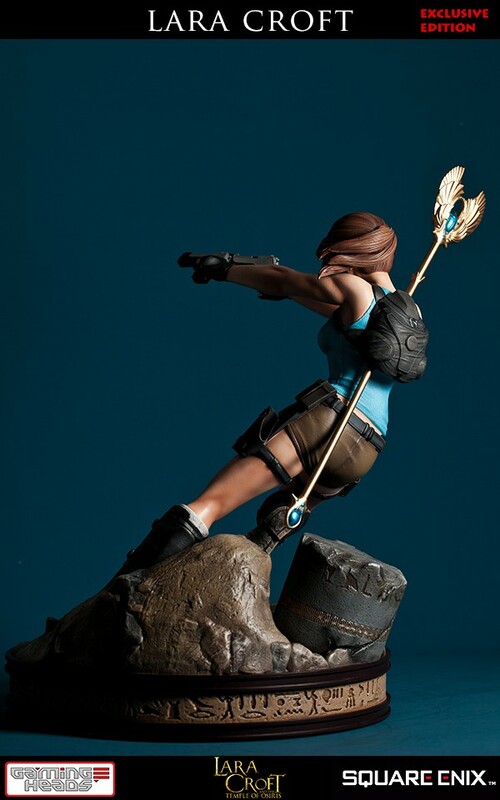 I have many statues from companies like Sideshow, Prime1, DC Direct etc., and Gaming Heads is definitely on par with other makers in the trade. 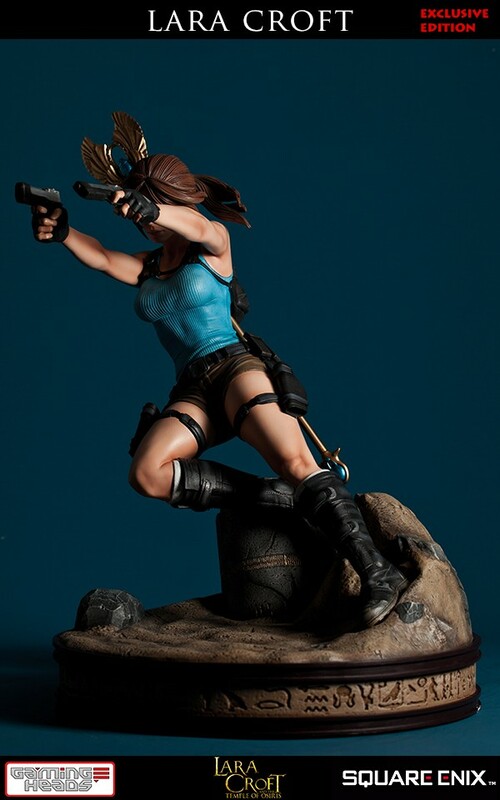 Beautiful and truly magnificent Lara Croft Statue! 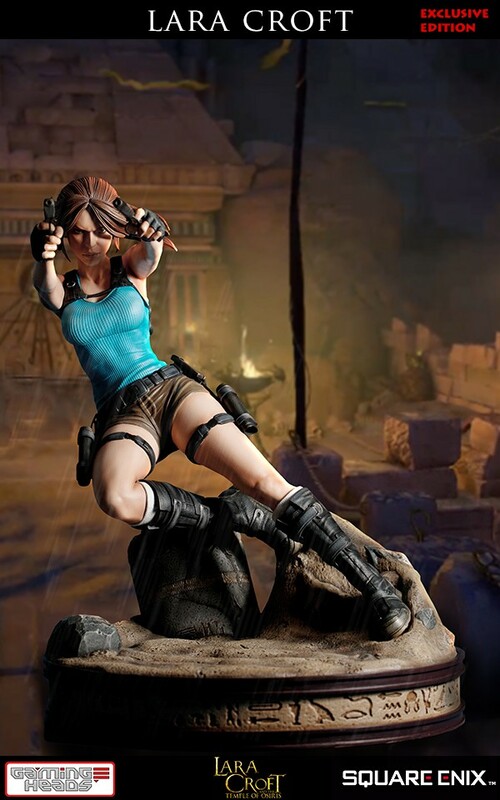 After failing to find a Tomb Raider statue that had the pose,outfit, and character likeness that truly said "This is Lara", I discovered this statue. 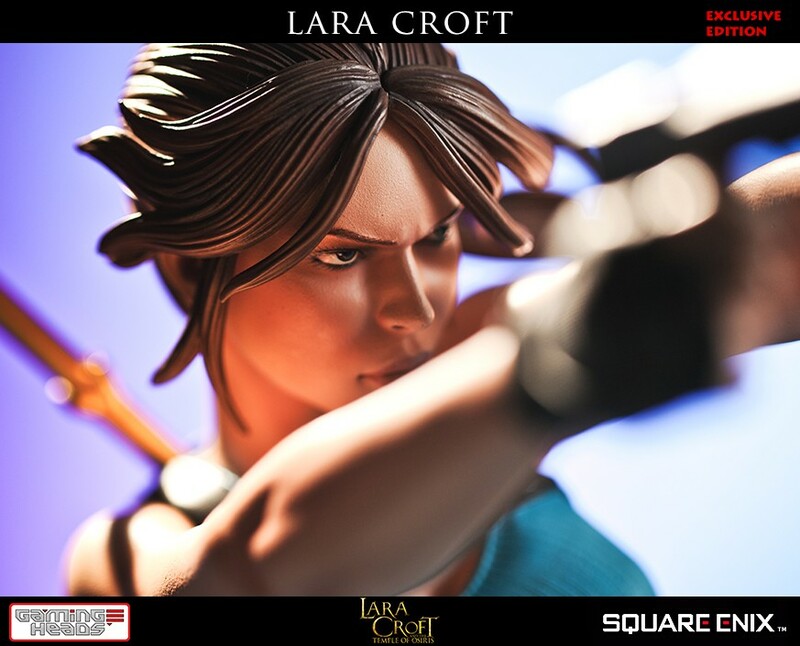 It's incredibly well sculpted down to the finest detail and the paint job is phenomenal in it's range. 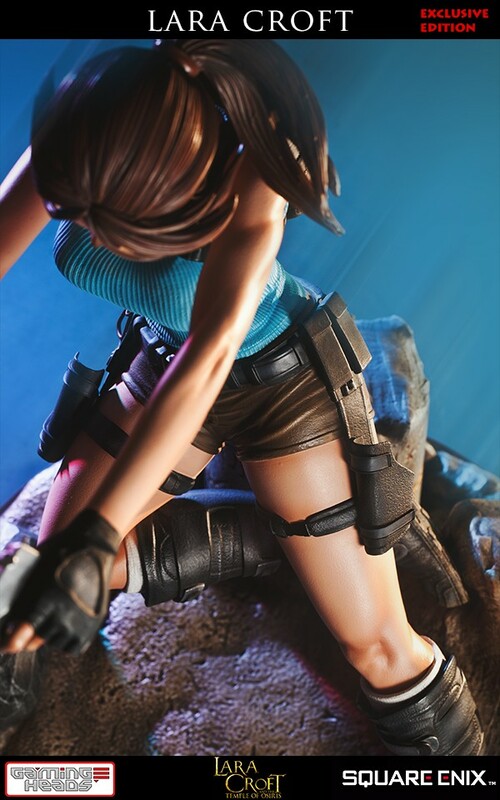 The ever-in-motion pose is dynamic and beautifully balanced while the crumbling ruins base puts Lara right in the midst of tomb exploration. The absolute best part though... the face. Soft and beautiful but with a piercing look of determination. 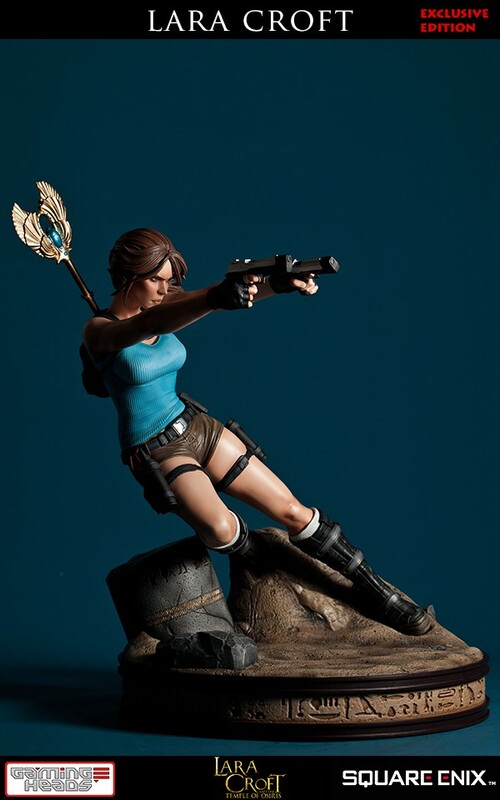 When accompanied by the signature dual wield pistols, it makes this statue truly great. 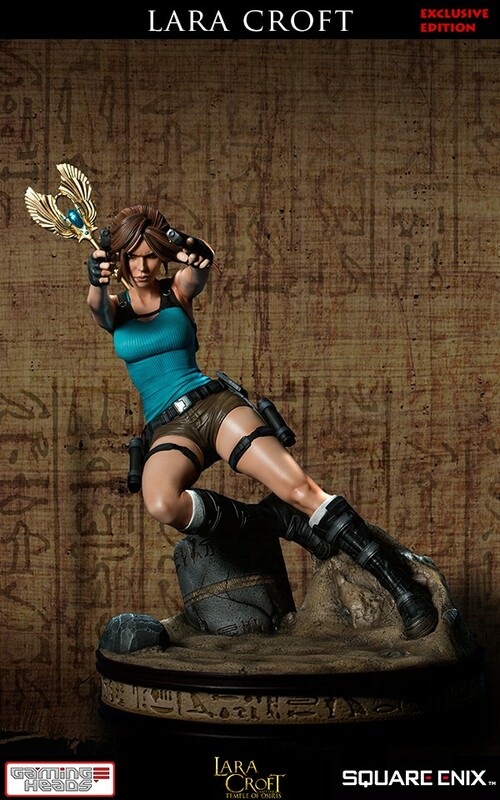 If you're a fan of Tomb Raider...Get This Statue! 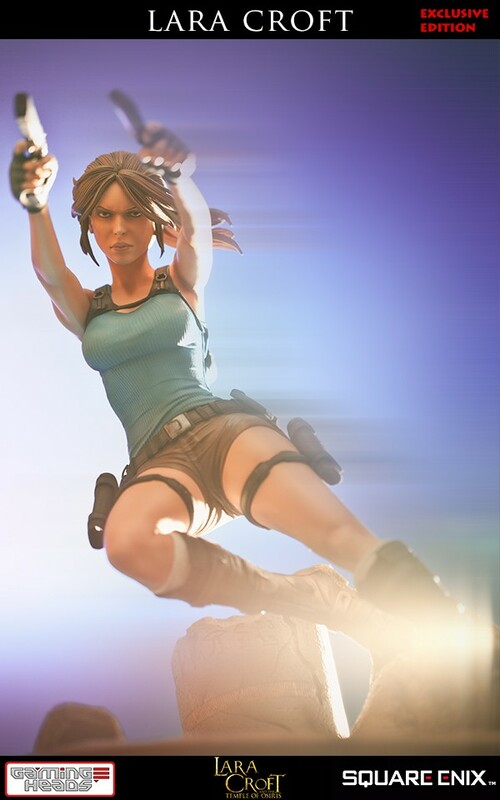 Lara Croft! A name known to many and one that's hard to forget and this statue is exactly the same. 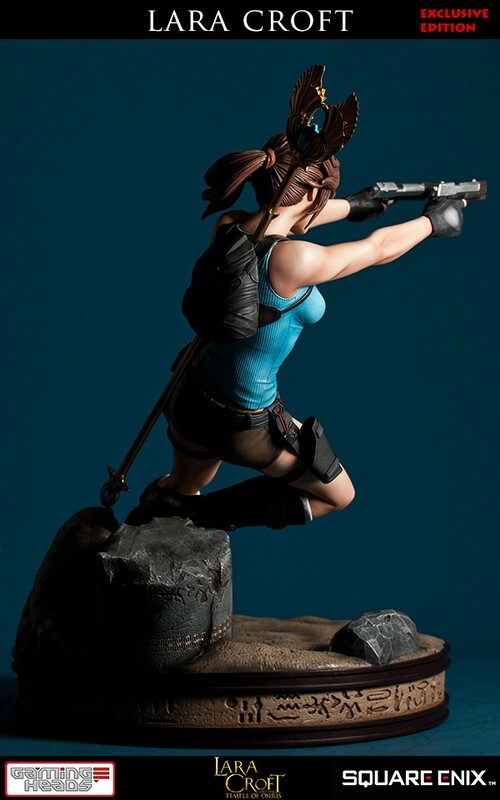 Gaming Heads have knocked this classic Tomb Raider out of the park, presenting a prized collectible that easily rivals and beautifully compliments some of the other Tomb Raider statues out there. 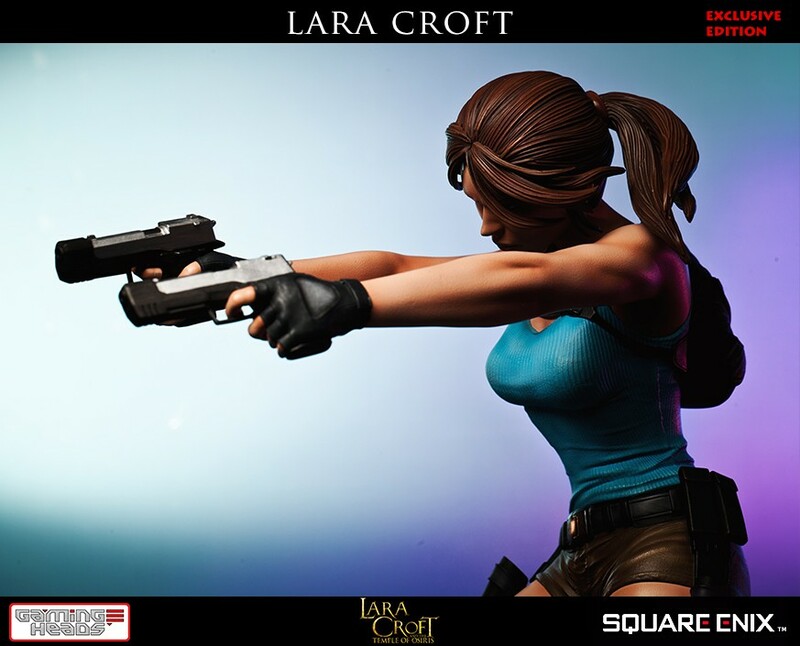 The attention to detail on this piece is second to none and whether she's displayed alongside a larger collection or highlighted as an individual piece, you'll definitely be stopping whatever it is you're doing every time you walk past, just to take in the overall beauty that is Miss Croft. 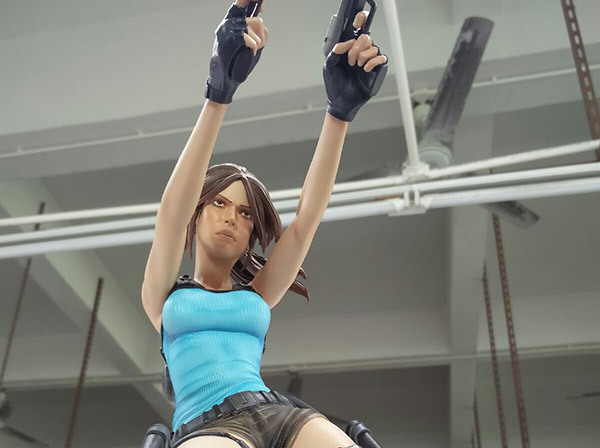 The second Lara Croft statue by Gaming Heads does not disappoint. 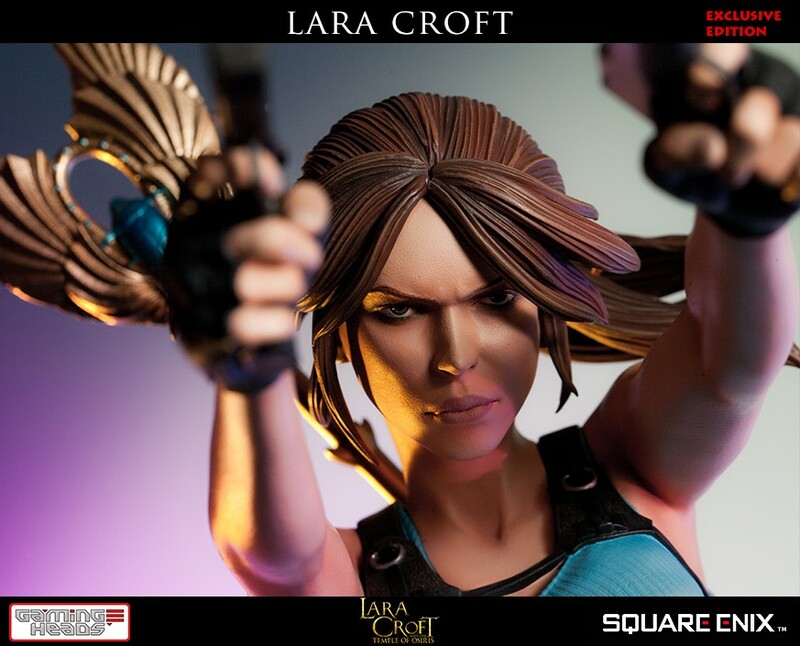 It is a well detailed figure & pretty lightweight which is a plus for me. 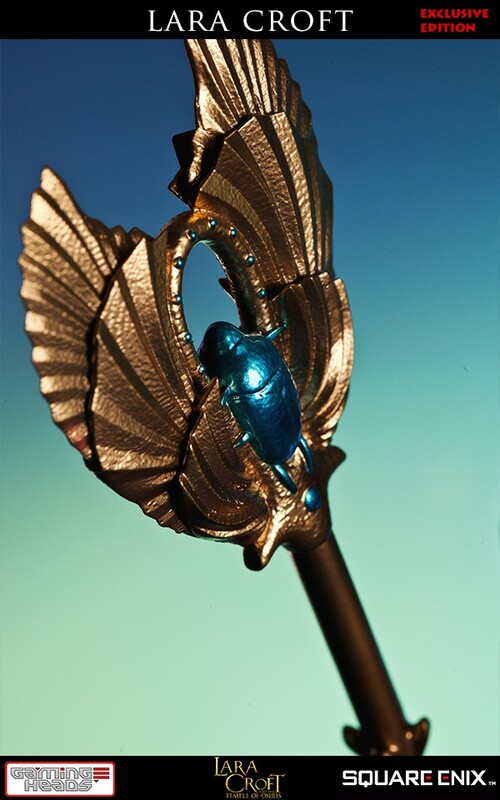 I already have it displayed in my glass case & is a beautiful piece of work! Thank you!! 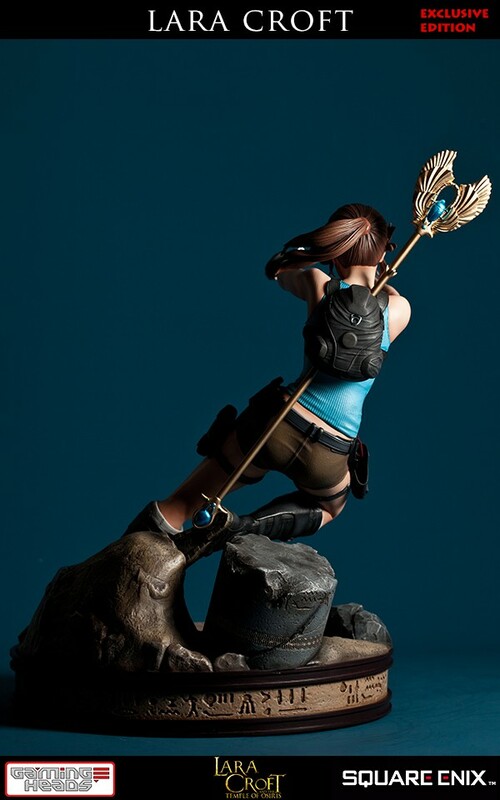 This statue is wonderful... 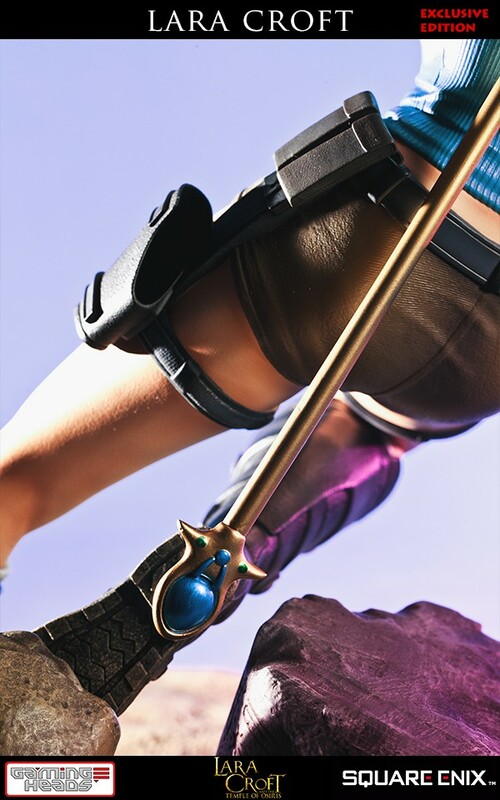 I was really surprised by the quality and the details. 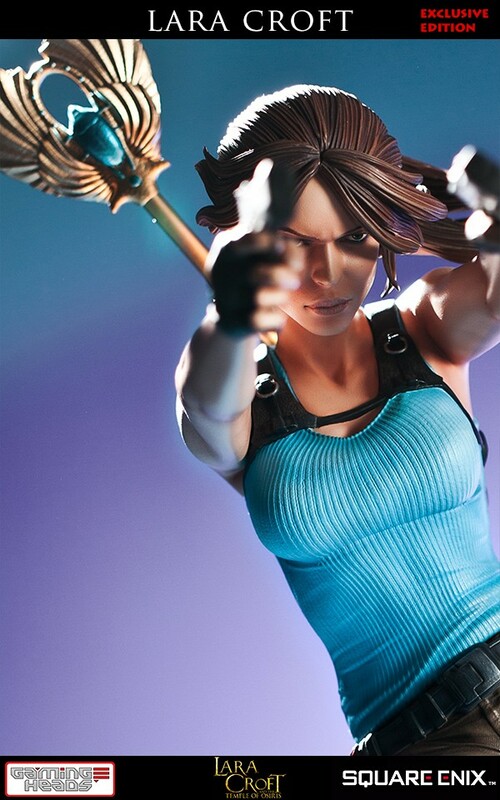 It is my very first purchase of an official statue and I do not regret it! Cette statue est superbe... J'ai vraiment été surprise par la qualité et le niveau de détail. 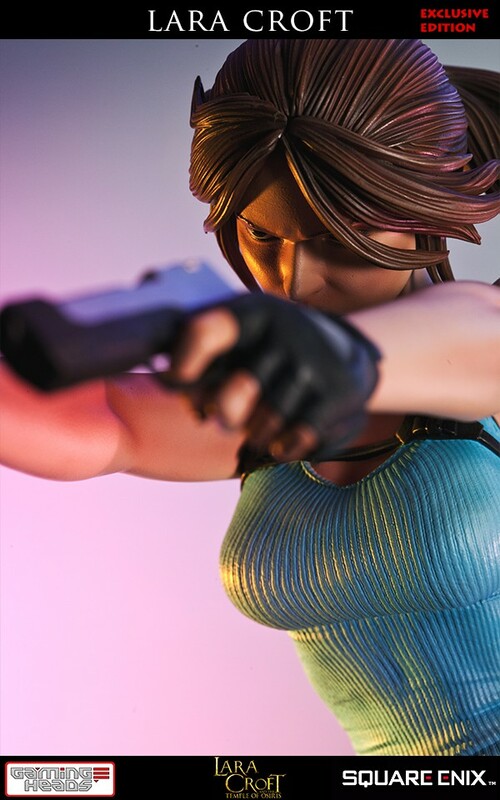 C'est mon tout premier achat d'une statue officielle et je ne le regrette pas ! 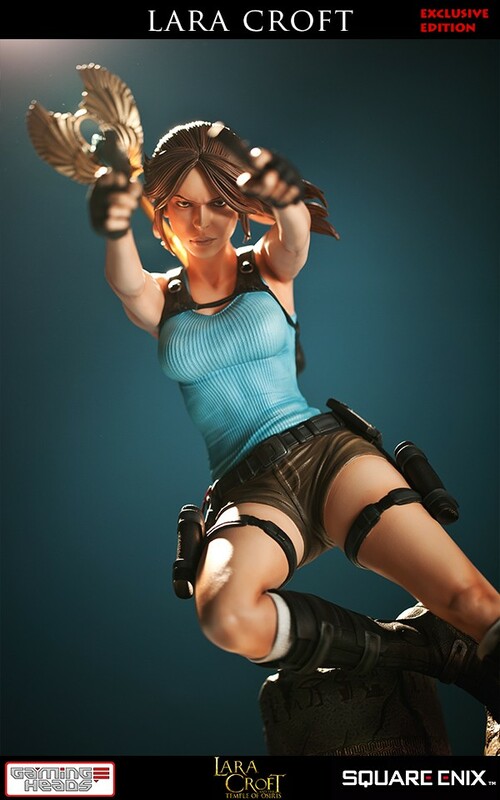 Phenomenal statue! Worth the price tag! 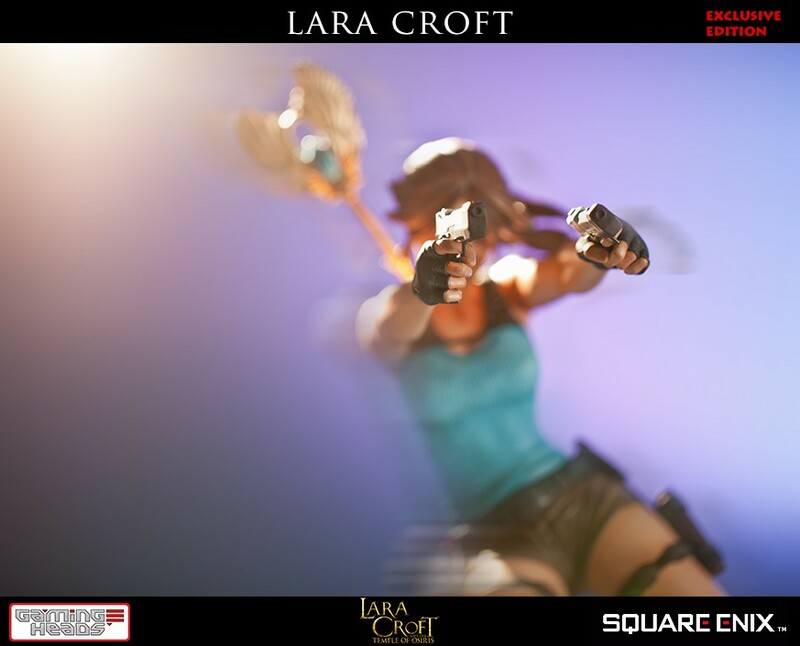 This is one of my many Lara Croft statues and she is my favorite statue to date so far, I am super happy. I ordered her and she arrived a week later and I have to say it was worth the wait. 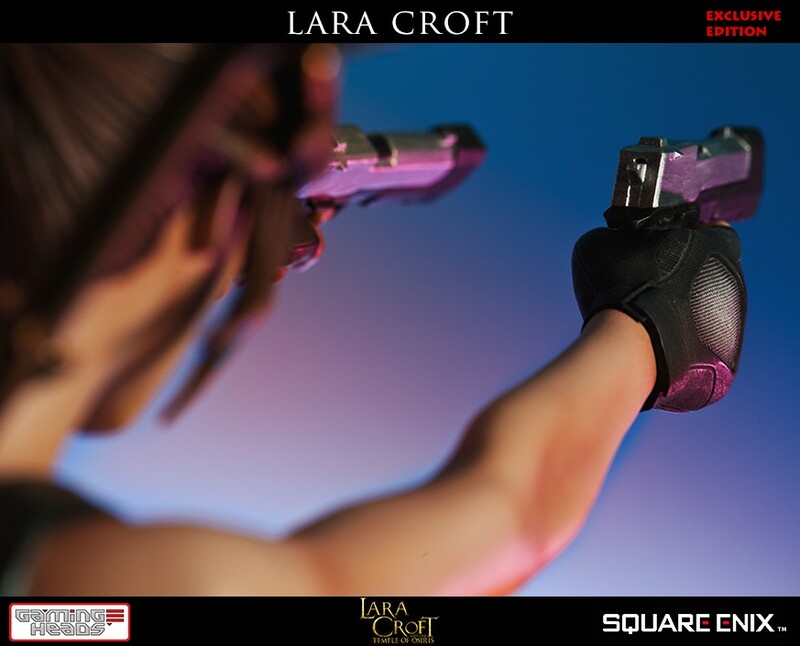 The quality is great, her face looks so detailed and accurate as well, in all I would say it is a great addition to your collection if you're a fan of Lara. 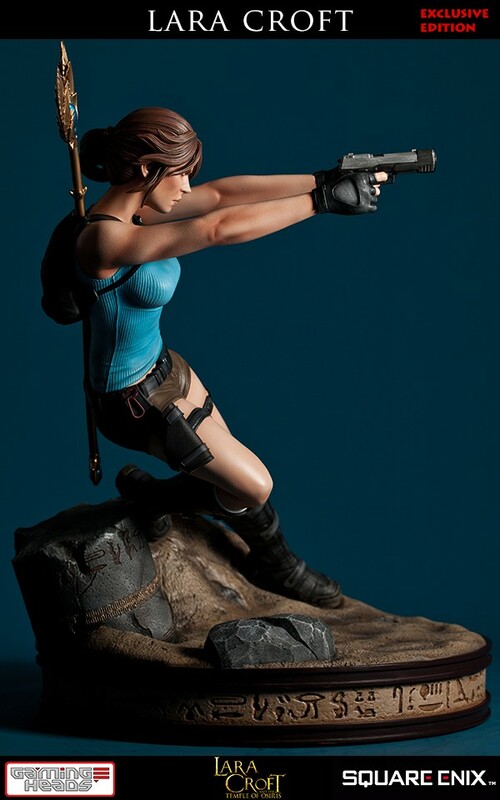 Phenomenal statue! Worth the price tag, I am over the moon with it.